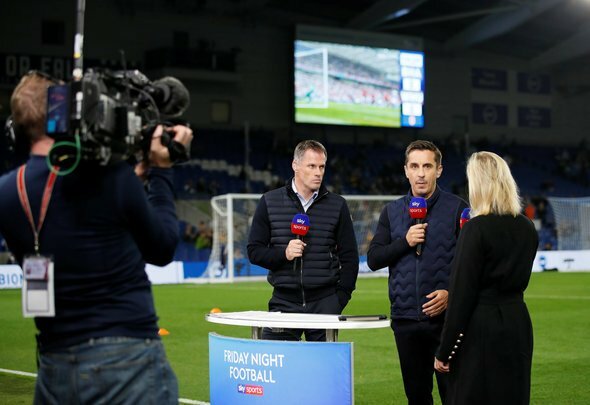 Sky Sports pundit and former Manchester United defender Gary Neville was left head over heels with what he saw from Liverpool’s full back pair in their win against Tottenham at an ‘incredible’ Anfield on Sunday. The Reds saw off their top four rivals thanks to a late own goal from Toby Alderweireld, Roberto Firmino and Lucas Moura cancelling each other out with their respective strikes in the 2-1 win for Jurgen Klopp’s men. Insisting that Liverpool did not have it all their own way, Neville was left drooling over the men on either side of defence – Trent Alexander-Arnold and Andrew Robertson. He told Sky Sports: “They weren’t at their best, Liverpool, and once Tottenham sorted out the tactical side of things in the first half where they just had a problem with the narrow midfield getting out to the full-backs – Andy Robertson and Trent Alexander-Arnold were running wild down those wings – Tottenham played a good game here and will feel really disappointed. It was Robertson who delivered the ball for Firmino’s opener and what a peach of a cross it was, floated through the air with pin point accuracy to give the Brazilian the perfect chance of sticking it into the back of the net. Alexander-Arnold on the other flank also caused havoc, both from open play and set pieces, and their attacking prowess has been a feature of the Reds’ tactics for much of this season. The way they manage to bomb forward and get into good positions to set up their teammates is obviously what Klopp wants from them and they are delivering on a regular basis. As Tottenham found out, if you give them the space and time, they will hurt you, and by the time they managed to shut them down they had already made the desired impact. Everyone knows that keeping them quiet is important to beating Liverpool – putting it into action is another matter entirely.